Amnesty International is running an awareness-raising campaign associated with the FIFA World Cup 2010, using an online video and microsite. 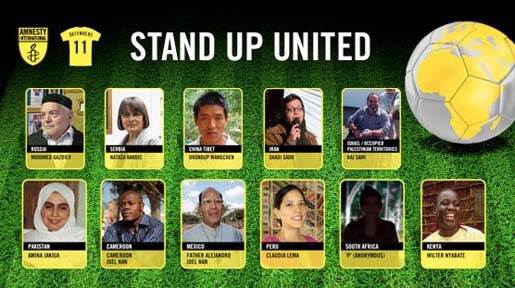 A video, “The Art of Great Defence”, associates great football defense moves with the Stand Up United team, featuring eleven defenders of human rights around the world. The campaign champions the work of activists from Russian Republic of Ingushetia, Serbia, China, Iran, Israel and Palestine, Pakistan, Cameroon, Mexico, Peru, South Africa and Kenya.